Bottom Rail – Bottom cross member mounted between the two vertical stiles. Café Style Shutters – Design treatment in which shutters are located in the lower, but not upper section of window. Casement Window – A hinged window that will either open towards or away from you. Casing – A decorative window or door trim. Center Rail (divider rail)– A horizontally mounted cross member that separates one section of louvers from another within shutter panel. This rail is optional and can be mounted at various heights. Louver Clearance – The space you must have behind shutters to open and close them. Color Match – A color equivalent to your paint or stain. Composite (faux wood)- A synthetic/man-made material that can be used as a substitute for wood. Divider Rail (center rail) – A horizontally mounted cross member that separates one section of louvers from another within shutter panel. This rail is optional and can be mounted at various heights. 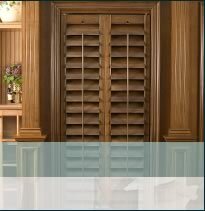 Double Hung Shutters – Design treatment in which two sets of shutters are vertically mounted one above the other within the same opening. This allows each set to function independently. Double Hung Window – A window with two frames of glass that both slides up or down on tracks. Finger Joint - A machining process where two or more independent pieces of wood are joined together creating a straighter and more ridged component. Hang Strip – A strip of wood or composite material on which shutters are hinged and mounted to an opening. Jambs – The window or door piece where items are hinged. Louver – Elliptical or flat shutter slats used to adjust lighting. Magnetic Catch – Installed to hold shutters closed. Mortise – The small recess at the edge of a shutter where the hinge is mounted. Mouse Hole – The small recess in top rail where tilt rod is located when louvers are closed. Mullion – Supports dividing window units vertically. Muntins – The grids that divide window glass into panes. Operator – The mechanism used to crank open casement windows. Panel – Consists of one shutter. Plantation – Wide louver shutter style. Post – A piece dividing shutter unit vertically into two or more sections. Rabbet – A piece molded into adjacent shutter panels to block light. Rail – A horizontal piece located within shutter panel. Sash – Pane of glass located inside a frame. Stile – Vertical pieces of wood or composite material that make up the sides of a shutter panel. Shutter Unit – A group of shutters, frames, posts and hanging strips used for the same opening. Single Hung Shutters– Design in which there is one set of shutters that runs the full height of opening. Sunburst – A curved shutter style where louvers radiate from center like sun rays. Tilt Rod – Typically found in the center of the panel, this small vertical strip of wood or composite is used to control louver movement. It may also be hidden from view. Top Rail – The upper most section of the panel frame centered between the stiles. Commonly mounted horizontally, this portion may be ached or mounted on an angle. Wraparound Hinge – An L shaped hinge wrapping shutter from front to back where it is attached. It may also be called an Offset Hinge. Z Frame – A shutter frame that creates it's own decorative window molding and mounting surface . 813-549-0546 4910 West Knollwood Street, Tampa, Florida 33634 Copyright 2019 Shutters and Millwork Industries, LLC. All Rights Reserved.